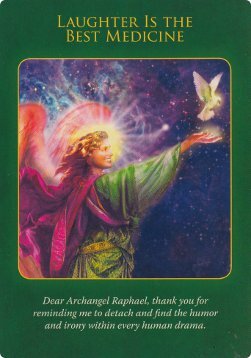 Card of the Day ~Laughter is the best Medicine~ Archangel Raphael reminds you that worry and stress never help any situation, but laughter and prayer do have curative effects. He’s here to help you see the humor within the human drama so that you can detach and lighten your heart. Raphael realizes that it may be difficult for you to smile right now, but there’s always big release felt after a good laugh. So with your permission he’ll help you smile and laugh more often. It’s very easy to get caught up in human drama, stress and worry. This is the time we need to take the advice of Archangel Raphael and bring joy and laughter into our lives. May you have a jovial day. I love you all.